The healthcare community is experiencing a shift toward value-based care with a focus on improving patient outcomes and experience. This includes prenatal care and birth outcomes. Premature birth (before 37 weeks gestation) and its complications are the largest contributors to infant death both in the United States and globally. Each year, the March of Dimes issues a premature birth report card for each state and select counties. For 2018, North Carolina earned a D grade, with 10.5% of all live births having been born preterm. Although Wake County earned a B grade for the lowest preterm birth rate in the state for 2016 (8.9%), there is still significant opportunity for improvement. 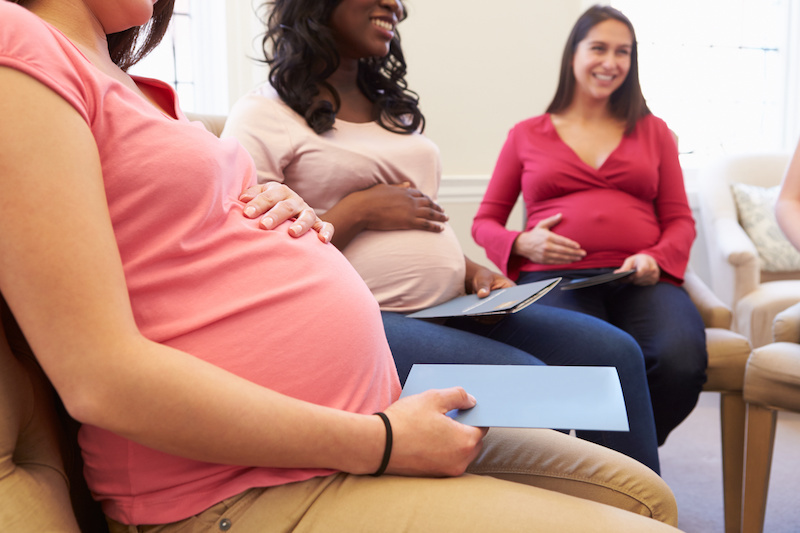 One of the ways that Triangle Physicians for Women hopes to make a positive impact is by offering CenteringPregnancy® — an evidence-based model of group prenatal care that improves maternal and child health outcomes and reduces health disparities. Expectant mothers follow a recommended schedule of 10 prenatal visits with each visit lasting around two hours. The schedule for Centering groups is the same as individual care, starting with four monthly groups followed by six bi-weekly groups. After 36 weeks, you will be seen weekly so every other week will be an individual appointment. These Centering groups include your Midwife, a staff facilitator, and other women/couples of a similar gestational age. Each group includes an average of 8-12 women/couples with due dates around the same time. Approximately 30 minutes will be spent measuring your own weight and blood pressure, and recording your own health data to encourage active engagement in your care. Each mom meets individually for belly checks and fetal heart tone checks with the midwife, while the rest of the group has time to socialize, build relationships and enjoy refreshments. After the health assessments are complete, the provider and support staff “circle-up” with moms and their support people and lead discussions and interactive activities about a variety of health topics including nutrition, common discomforts, stress management, labor and delivery, breastfeeding and infant care. Once everyone delivers, the group will reunite for one more session. Moms in Centering groups spend 10 times more time with their provider than women in traditional care resulting in increased patient satisfaction. CenteringPregnancy® often results in greater self-care because moms are more actively engaged in their own healthcare through the management of their own health information. Research indicates that Centering moms have healthier babies and nearly eliminates racial disparities in preterm birth. The cost of preterm birth and related conditions is more than 10x that of a healthy baby. Centering could save the healthcare system $8 billion each year by preventing preterm birth alone. Centering moms are better prepared for labor, delivery and caring for their infant. Practices that offer this type of care have reported fewer after-hours calls and emergency visits because expectant mothers are more knowledgeable about what is normal during pregnancy and what is cause for concern. Women in the same group often create lasting friendships and are able to support one another as they go through similar experiences. While all expectant mothers can benefit from this model of prenatal care, Centering can be especially beneficial for first-time moms, military families, those that do not have a strong support system nearby. Although Centering is an alternative to traditional prenatal care, it is billed the same as traditional one-on-one prenatal visits so your insurance coverage will be the same as if you were having traditional care. The only additional cost to you is a nominal cost for the Centering materials. At Triangle Physicians for Women, we believe in empowering women to be active participants in their health throughout their pregnancy, labor and delivery, and beyond. By offering Centering, in addition to traditional prenatal care, our goal is to help families to have the labor and delivery experience that they desire. Triangle Physicians for Women is currently the only practice in Holly Springs, North Carolina, and one of only a few in the Triangle, that is qualified to offer CenteringPregnancy. If you’re on the fence, we encourage you to attend the first two group meetings before deciding which approach to care fits you best. For more information about joining a group, call 919-678-6900.